it's no secret that stripes are a staple in my closet year-round. but now that every brand has jumped on the breton bandwagon, which ones are worth buying? this is a perennial question from readers, so these are my picks for the best stripes of the season. 1. the French mariniere classic (also here) // in good company with everyone from the young Coco Chanel to Jean Seberg to Pablo Picasso; this is old school and original with a classic unisex/slouchy fit. i have several in different colorways and always pack at least one on trips. 3. the midweight stripe knit (also here) // the thicker cotton pullover is ideal as a transitional season sweater or layering piece. 4. the breezy breton dress // an easy staple for spring and summer; as soon as it hits 70 outside i'll be wearing this with white Chucks. in terms of style and utility, i find that having a stash of go-to breton shirts makes minimal travel packing a breeze. do you wear/collect breton shirts? what's your favorite style? I have the white/blue and navy/red. I like the boat neck twist, they're extremely soft, and has held up really well despite many washes. Great post! I want to add another striped shirt now, hehe. Maybe a mid weight one. 1. Should not be boxy. Rules out all the popular old stripe makers listed above. 2. Should not have droopy shoulders. Rules out everything out there this season. 3. Should not be high contrast that they can be seen from a mile away. The thick stripe ones do that. I look for subtle thin stripes. Again, thats the reason zara ones are the only ones i found so far. 4. I only wear them during the colder seasons. I prefer no pattern/plain simpler looking clothing during summers. My zara ones have held up for 2 years so far. Material is fine, stitching is coming undone. Vine and NLST makes high quality clothing. lucky you with the zara ones! i bought one during the sales a few seasons ago and they shrank in all the wrong places after 1 wash. Still love my CdG Play striped tee, it's a thicker cotton and holds up well in the wash. Debating purchasing another, actually. 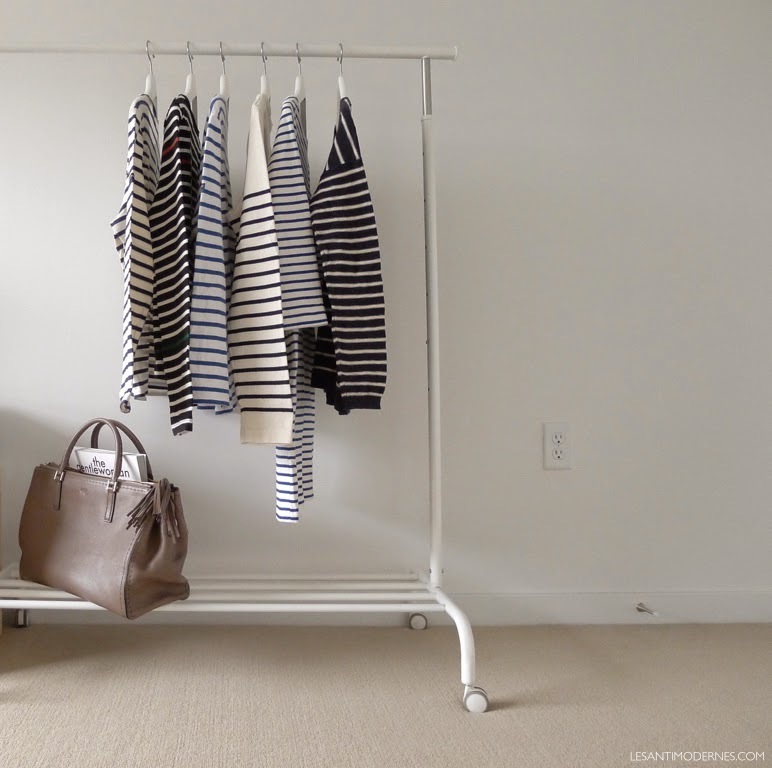 La Garconne always has such a nice selection of Breton tees, I always want one of each that they sell! I just purchased my first saint james and I really like it. I do think the fit is a bit off but I like the material and the color so much! I have a unisex St. James mariniere that is just too stiff and boxy on me; I prefer a slightly lighter-weight fabric. The CdG striped shirt is also adorable as a tee. For something so simple, why is it so hard to find one that's just right? I recently picked up a new one to replace the Proenza Schoulder one I had parted with late last year. I tend to collect stripes but never really seem to find the right one? I need to stumble across a breton stripe dress! Petit Bateau is my fave brand. I've owned three in the past decade. I like the slightly heavier weight. I have a lighterweight one from Muji that's great too. I don't like striped tops that are too tight. I feel like Bretons should have some roominess. Petit Bateau, Petit Bateau, Petit Bateau. The fit is always spot on and they last forever. I love my St James unisex navy/white stripe the best. It seems to work for my shape. I have a ton of other brands...VINCE is a fave...but always searching for more. What about men's? What do you think of Armor Luxe? I have close to 40 bretons (shirts and dresses), more than 1/4 are Armor Lux. I have the long sleeve heavy weight cotton knits, the long sleeve light cotton tees, and a sweater dress. I love the l/s sleeve cotton tees - they have that loose oversized feel around the shoulders, sleeves and upper torso, but they do narrow slightly at the waist. I get my usual size (T0, or XS) and find them to be slightly and perfectly baggy. The rest of my collection are Saint James minquier 10s, and I have a Naval II too. Since I'm petite, I actually like the fit of the J.Crewcuts x SJ best - I get the boys size 14 and the torso is perfect and the 3/4 sleeves not too tight. I also have two CDGPlays, one in XS (blue) and one in S (red) and I actually think my next one will be a M, because I feel sometimes the S is not loose enough. My Petit Bateau x Kitsune long sleeve fall weight l/s breton is my go-to during the winter - PBs absolutely have the best fit for layering AND solo wear. My other bretons are from H&M, Joe Fresh, TopShop and APC - purchased as trial and errors. From now on, I'm limiting my bretons to PBs. I'm always looking for a white w/ red stripe in a boatneck with a white yoke - that's my unicorn. But does Petit Bateau make them in sizes that might fit the "average sized American woman"? i.e. Size 14? eeps, that's damned impressive by anyone's standards! I have one - a fitted boatneck from Eileen Fisher. It's a heavier weight fabric, and somewhat dressy. I'd get a second that was more casual. I like the cheekiness of the CdG. But that would be enough. I don't get why more than that would be necessary. When you're a stripe junkie, there's no such thing as "enough"! if I'm not wearing solid black or white, it's a stripe. anyone have thoughts on / plans to check out everlane's stripes? Am asking for a St-James when my husband visits Paris next please let me know about style and sizing. I was looking at the Meridien II. Thanks!